Mother’s Day is just around the corner. If you can’t decide what you should get Mom, the most important and irreplaceable people in our life, for her special day this year. 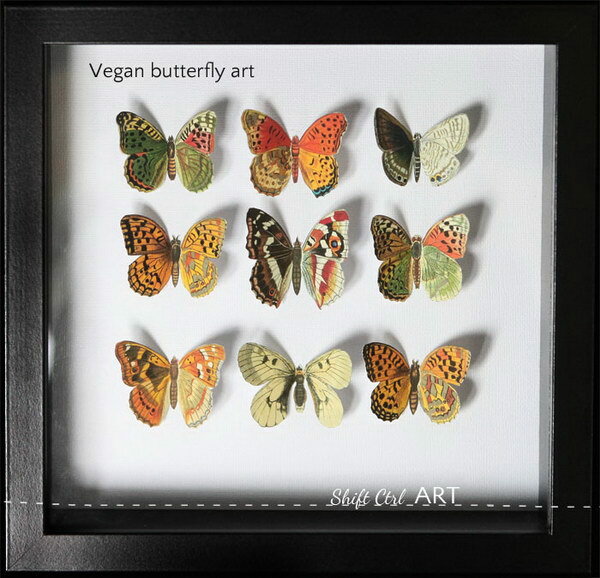 Here we have a great collection of DIY gifts for your inspiration. From personalized mugs, stylish kitchen tools to customized photo gifts, this collection of more than 30 DIY gift ideas is fabulous. Take time to browse these collections and show how grateful you are for all that she has done for you with these cute and heartfelt DIY gifts. Turn an altoid tin into a beautiful prayer box with your worries or prayers down! 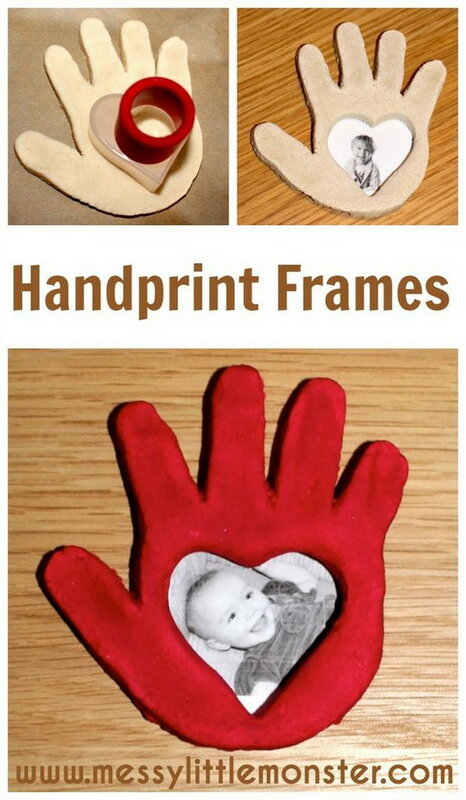 This would make a cute secret gift for moms! Get the DIY instructions via travelersdream2012. A vase of fresh flowers in this handmade mason jar picture vase will be the perfect gift for mom. Learn how to make via homestoriesatoz. Create this beautiful photo holder with a piece of wood and a few metal clips. You can also customize with a very special message or some pictures for your Mom. This will be a great Mother’s Day gift. DIY instructions via shanty-2-chic. 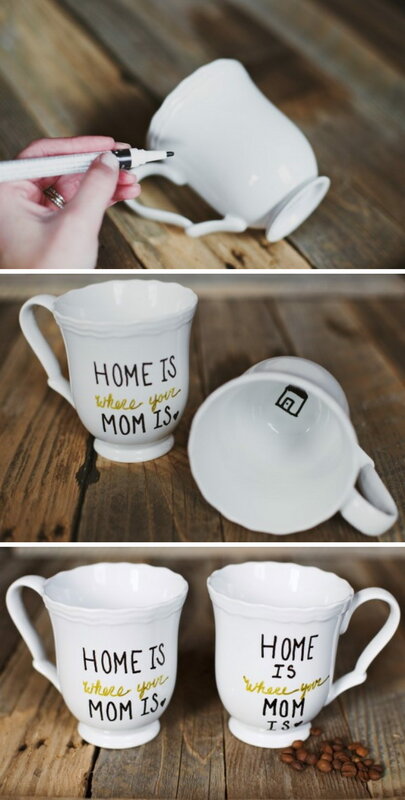 You can make Mom some perdonalized mugs like these. All you need to do is to wake, write, bake. It is super easy and fun to do in several minutes. DIY instructions via gimmesomeoven. 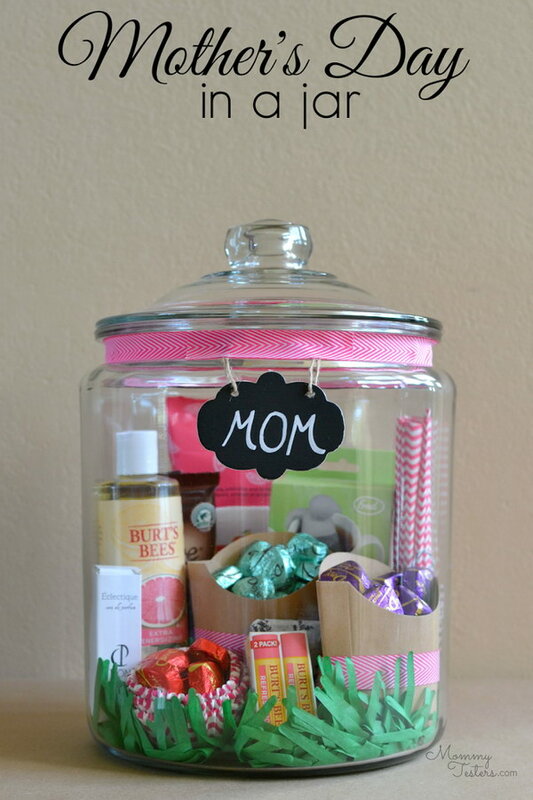 Fill a container with special treats just for moms. This is a great gift for moms who seem to have everything. Get the free printables and details via eighteen25. Transfer the boring kitchen tools by dipping them in pastel paint. 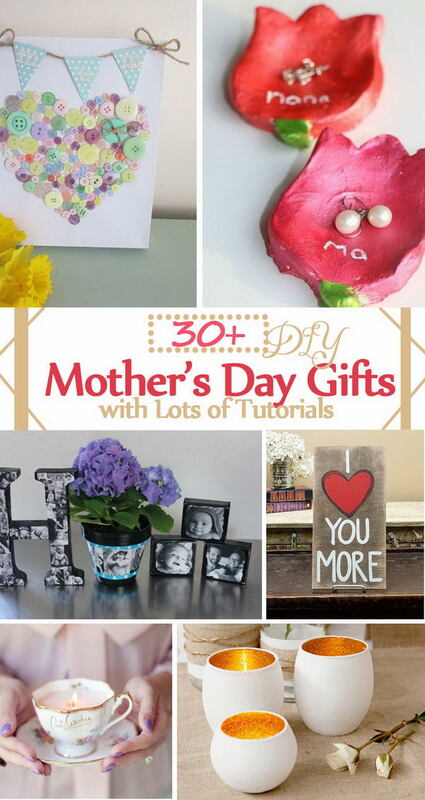 These can be great homemade gifts for your mom. Diy instructions via earnesthomeco. Food and flowers! 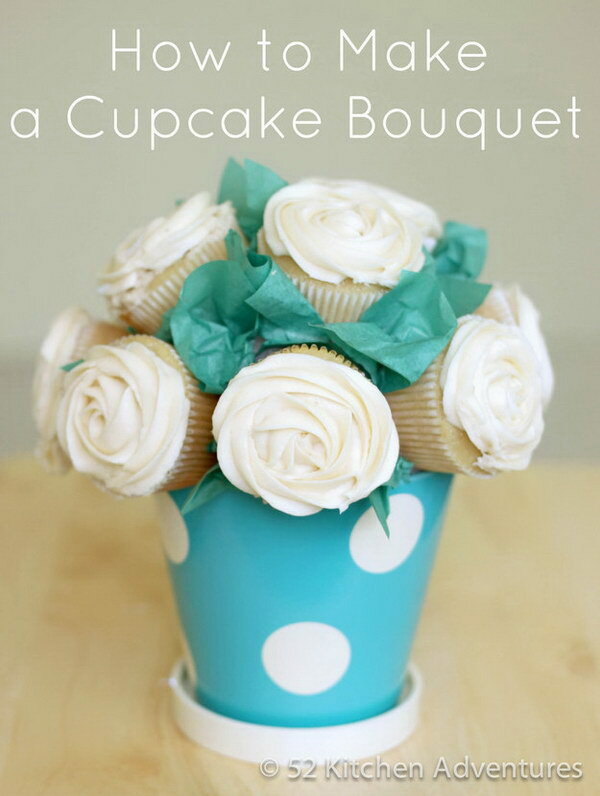 This homemade cupcake bouquet would be a lovely gift for Mother’s Day. Learn ablot the steps via 52kitchenadventures. For just $2, you can create mom a handmade personalized gift with some plats from dollar store and a sharpie. Eay and fun! Learn about the instructions via eclecticallyvintage. This Sharpie craft idea works much like the Sharpie mug. Easy and fun to make in minutes, and makes a perfect gift for Mother’s Day! See the easy steps via thesweetestoccasion. 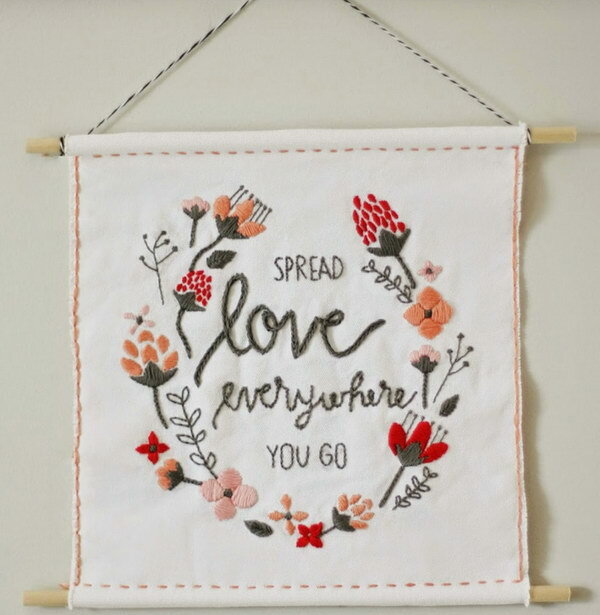 Get your embroidery thread collection out of the closet and craft this lovely wall hanging. The red and pink color scheme is sure to be a hit as the gifts for mom. Get the full instructions via prettylifegirls. Photos always make great gifts for mom. 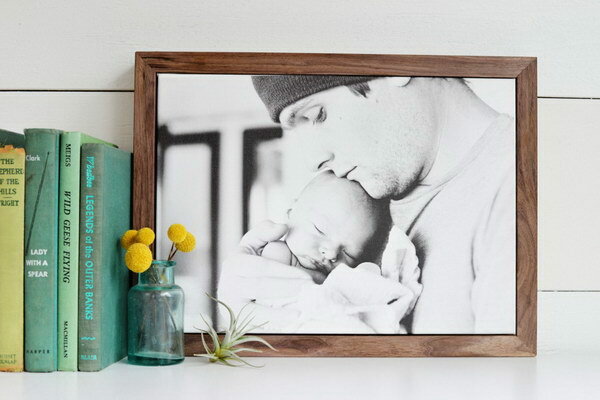 Gift your mom with a canvas of her favorite people, framed in a lovely wood frame. Full tutorials via homedit. 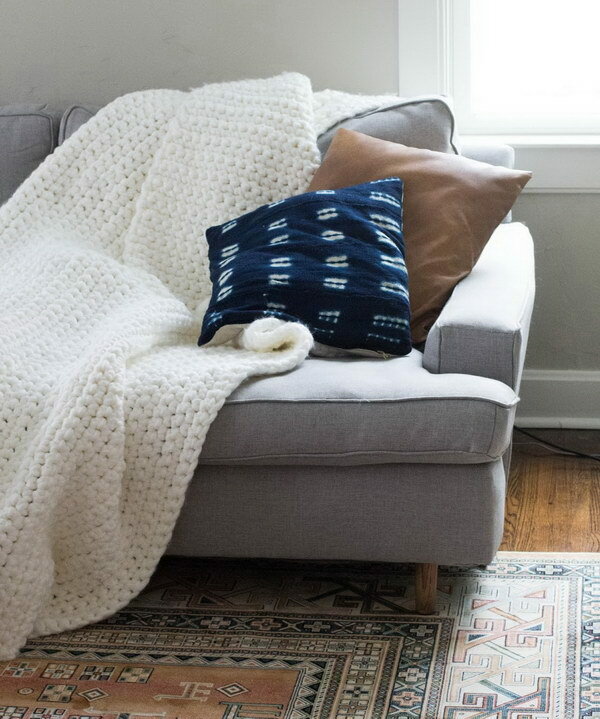 If you have the time, crochet the easiest, coziest, most rewarding blanket for your mom. This can be a very practical gift! Learn how to crochet via alwaysrooney. Gift your mom with a gold taped searving tray this Mother’s day. Stick and serve! No dry time required! It is that easy! 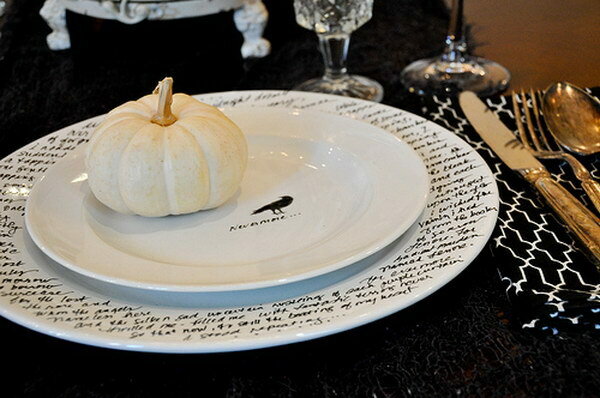 Learn about more DIY details via theeverygirl. Mother is amazing. loving, beautiful, humble, patient, creative. 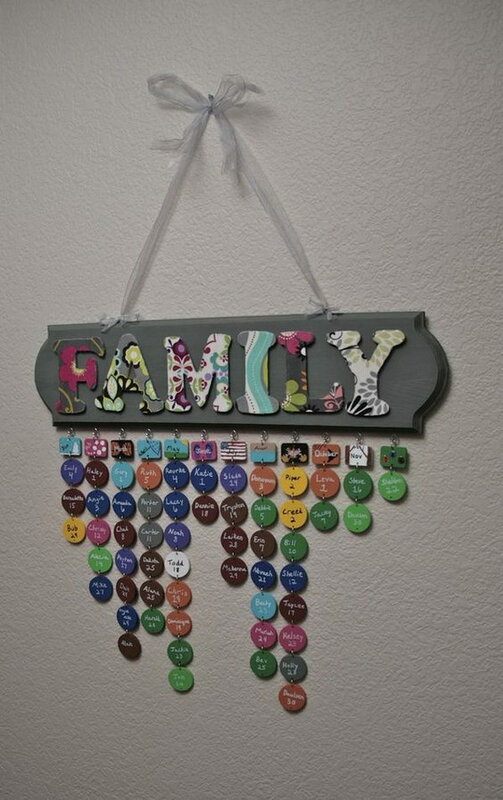 Show how truly awesome your mother is with this creative DIY plaque wall art. Get the DIY tutorial via realitydaydream. 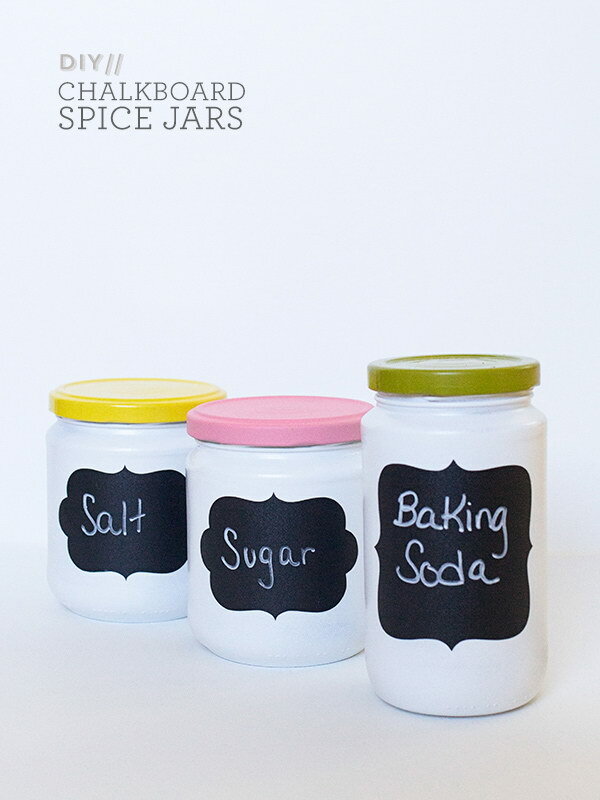 Create your own version of Anthropologie’s chalkboard spice jars and your mom will love it very much! DIY details via sarahhearts. 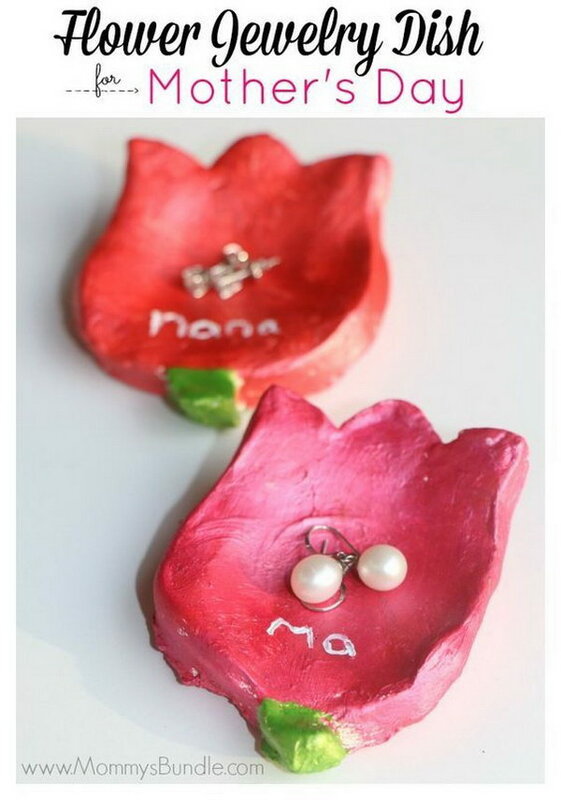 You can make mom these lovely flower-shaped jewelry dishes. They are small enough to carry around and leave in the bathroom for storing one or two pieces of jewelry. You mom will love it forever! Tutorial via mommysbundle. 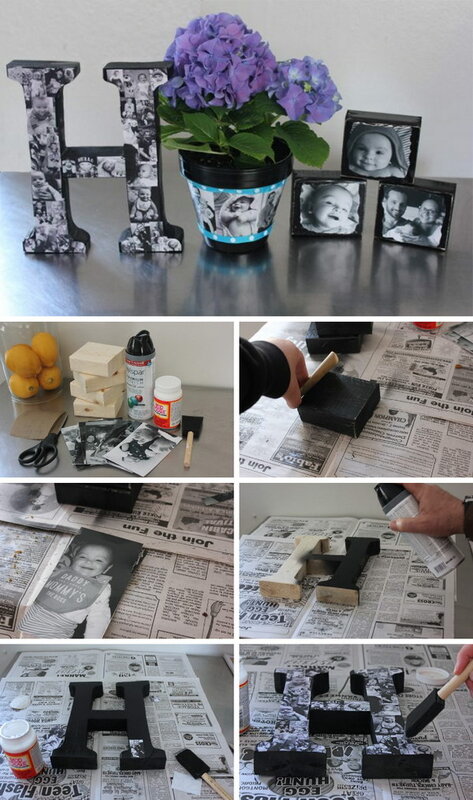 Decorated the wood letters with black and white photos, this DIY photo letter is the best gift for family and friends. See more tutorials via ehow. 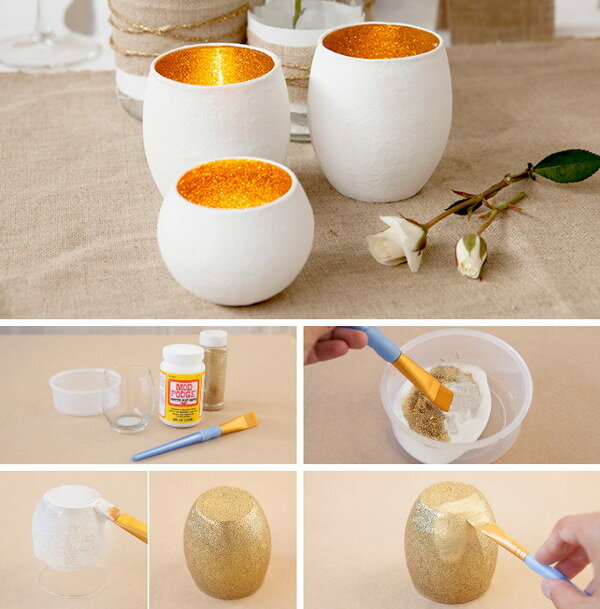 These stunning glass votives are so easy to make with some gold acrylic paints and white mod podge. They make a beautiful table decoration idea or you can also use it as a gift for your loved ones, like your mom. DIY instructions via taradennis. What a pretty necklace! Make your own $68-looking Anthropologie designer necklace as a gift for Mother’s Day. All you need are some beads, wire, and wire-working skills. Check out the details via quietlioncreations. Make a family dates calendar and never forget a birthday again! This makes a great gift for Mom who has devoted to family. Get DIY instructions via acraftyescape-katie. 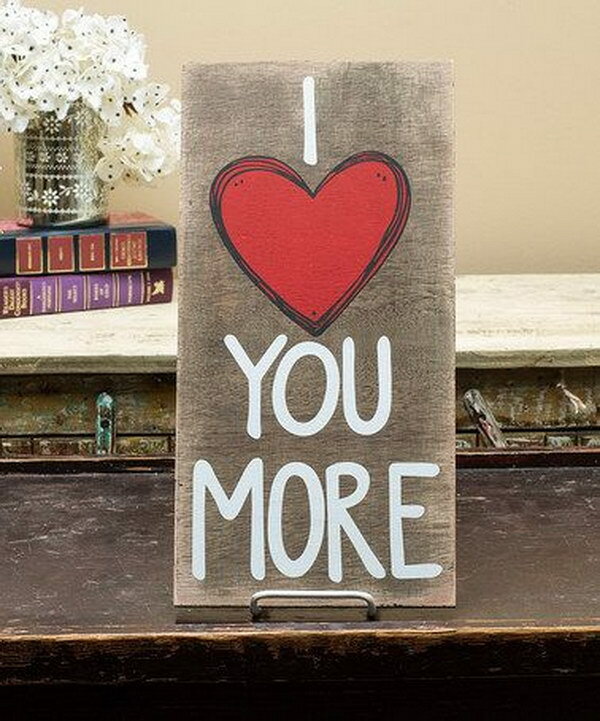 Show you love to mom with this cheerful and colorful plaque. Details via zulily. 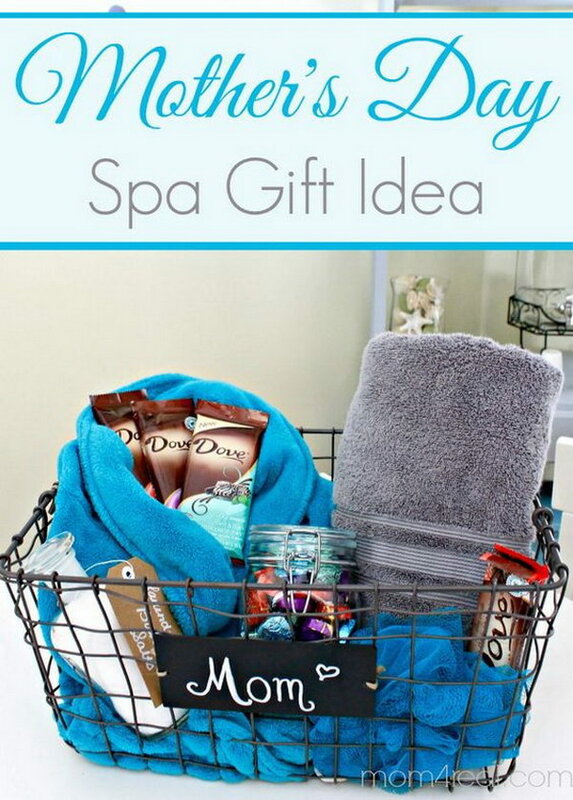 Go with a special gift like this spa gift basket that she can really use to relax. See the details via mom4real. Fill a mason jar with what you want to give to your mom. What a cheap but sentimental way to show your love on Mother’s Day! Get details via hellosplendid. 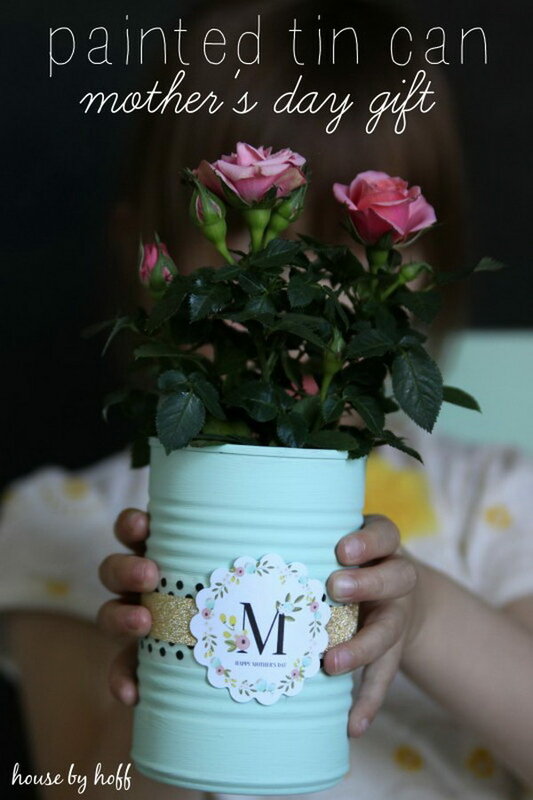 Another quick and easy Mother’s Day gift idea with this adorably stylish Mother’s Day photo vase! Learn how to make it with the instructions via catchmyparty. This ia a simple craft that even kids can create. Fun and meaningful gift for someone special this Valentines day or Mothers day. DIY instructions via messylittlemonster. A great gift for mom from daughter! Easy, fun quick to do with washi tape and paints! See the tutorial via housebyhoff. 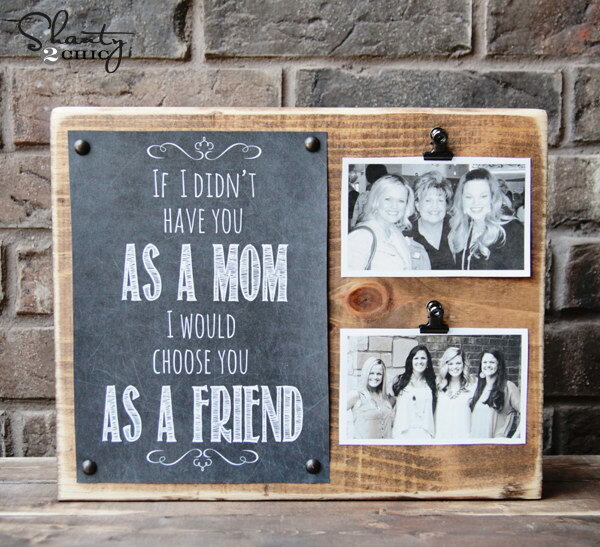 Mother’s Day DIY gift idea including the free printables via ahomefordesign. 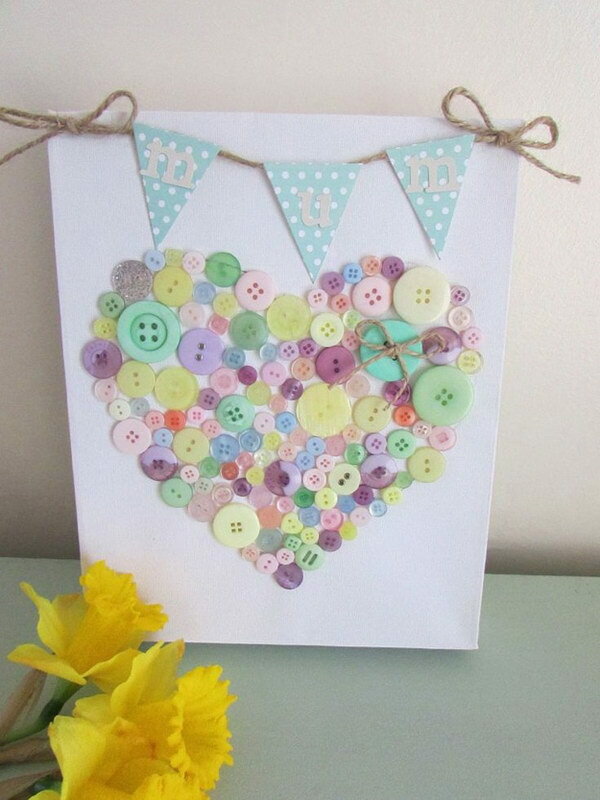 Make your mom a beautiful canvas with colorful buntings and leafover buttons in a heart shaped! Easy and fun for kids to make! DIY instructions via hobbycraft. Homemade bath products always make great gift ideas. Let your Mom relax in a soothing bath with this homemade sugar scrub. Get the recipes and DIY instructions via pioneersettler. Fun to give and recive Mother’s Day gift idea! 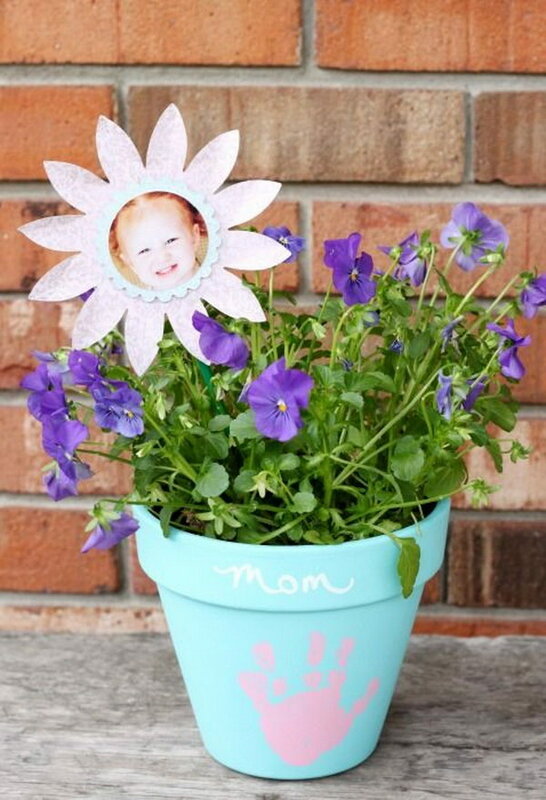 All you need are a terra cotta pot, paints and your mom’s favorite flower from the garden store. Easy to make in 5 minutes! See the steps via extraordinarymommy. Thank you for including us in your wrap-up of ideas. Hi, Danielle! Thank you so much for your kind words. The project is awesome! I love your Diy, idea’s they look so great and super easy to try. I love all of these! My mom will love what I’m gonna make for her! Thank you soooo much!!! ? They are all so cool.